Mom, the Intern: How I got "fit" without any exercise! 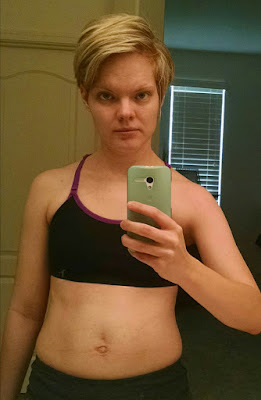 How I got "fit" without any exercise! 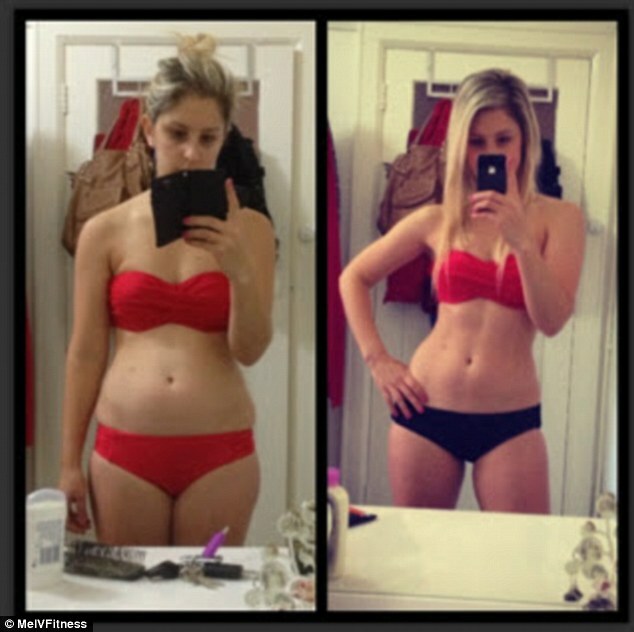 Many of you have seen the viral post of the Australian woman who was able to go from "flab to fab" in under 15 minutes. As a fitness trainer, Melanie Ventura knows all the secrets to make yourself look slim in a photograph without doing any exercise. She revealed she simply changed her posture, flexed her muscles, positioned her body differently, sized up on her swimsuit bottom, let down her hair, put on some makeup and added a filter. She used this collage as an example of how unreliable before-and-after fitness shots can be, proclaiming you can change THIS MUCH in just two weeks (or some other unreasonable amount of time) by simply buying into a certain diet or exercise plan. 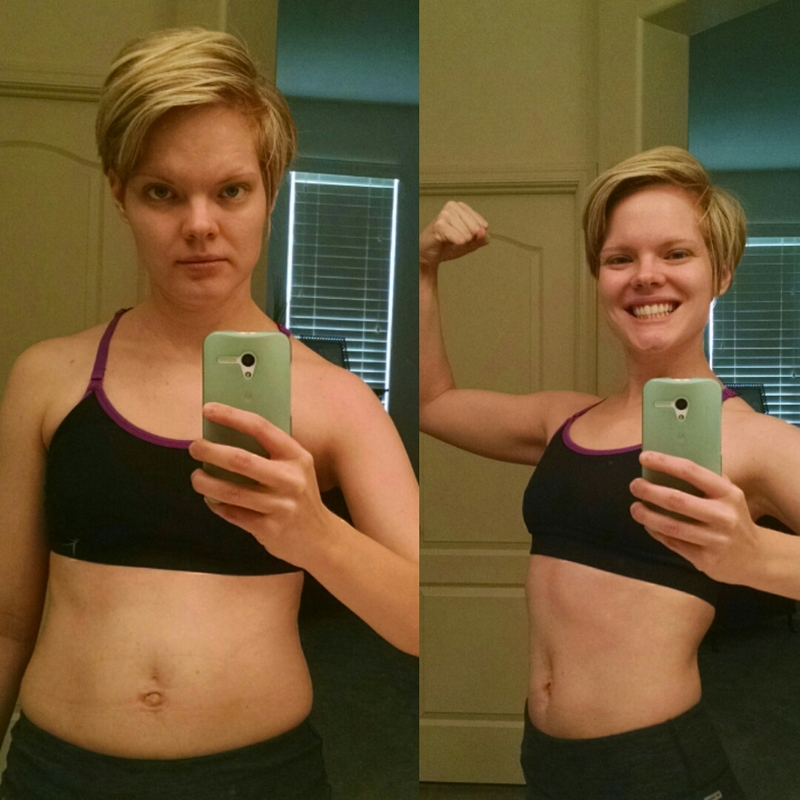 Here, the transformation only took 15 minutes and absolutely no exercise! Obviously, this woman is a fitness trainer, so she does have a toned, slim body to begin with. Me, on the other hand? Well, I try to eat healthily -- avoiding white sugar and flour, red meat and preservatives while incorporating fresh fruits and vegetables whenever possible -- but I'm not a freak about it. Since Thanksgiving, I've supplemented my diet with a steady supply of chocolate and other candies. You see, as soon as the Christmas candy ran out, along came Valentine's, and now we're working on Easter, and well ... you know how it goes. As for fitness, I exercise for 20 - 30 minutes (mild to moderate level) every day. I could probably run a mile, but it might take me 15 - 20 minutes. And I hate running, so we may never find out. I decided to try the photo experiment for myself after a recent workout. Could I drastically change my appearance just by making a few simple tweaks? I didn't bother with hair, makeup or filters like Melanie, but the results were still striking. In the picture on the left, I slouched. I faced the camera directly. I didn't smile. I relaxed my muscles. In the picture on the right, I moved closer to the light, adjusted my pants a bit, stood with tall posture, engaged my core, flexed my arms, turned to the side and stuck my chin out. Oh, and I smiled. It literally took me only a few seconds to do this, yet I look like I lost 10 pounds. Melanie's simple tricks worked. You can't trust a photograph. In my everyday life, I look more like the Jenna on the left than I do the one on the right. I don't walk around like a fitness model all day, flexing and posing with my guns up. I drive kids back and forth, fold laundry, make meals and chase my toddler. I eat a lot of "discretionary foods," aka treats. I stay up late and watch Netflix. I slouch. So, here's my question: why bother scouring the Internet for "fitspiration" when the pictures you find could be outright hoaxes like Melanie's and mine? Pictures are POSED. They are edited and often digitally enhanced. They are selected carefully for consumption. They are trying to sell something. They rarely reflect reality. Second point: Attitude is everything. Look at your body. Really look at it. Every part you love and hate. Now, call each part what it is. "This is my abdomen. These are my arms. These are my legs. This is my waist." Accept that your body parts look way they do and choose to be happy about it. The first step to wellness is a positive mental perception. Love the body you have, be grateful for it and start treating it that way. Exercise and eat right JUST because you care about your body, not because you want it to change shape. Because guess what? It will NEVER look perfect enough. And if you miss a workout or choose to eat a treat? Oh well! Life is about balance. Saying, "I love my body, but I wish it were thinner" is like saying, "I love my daughter, but I wish she was an opera singer." Seems harsh, right? Unreasonable expectations only lead to disappointment. As a society, we'd do better to stop relentlessly pursuing unattainable fantasies and embrace reality. Give it a nice, big hug. Live in the moment. Find joy in the journey. How do you cultivate a positive body attitude? Start smiling. Don't hide from cameras. Wear the clothes you like and wear them proudly. Eat in public. Have that cupcake. Skip your workout to go visit a friend. Cry all your mascara off. You will not turn into the old hag version of the queen from Snow White. I promise. And stop punishing yourself. Life's hardships are difficult enough without additional self-loathing. Happiness is not found in looking thin or fit. In fact, happiness doesn't even need to be found because it's not hiding from anyone. Happiness is simply the choice to be grateful. It's rejoicing in all the wonderful parts of life, including having a body and appreciating all it does. Without it, you wouldn't be capable of experiencing anything. So, the next time you don't like what you see in the mirror, remember my photo experiment. Stand a little taller, look yourself in the eye and flash yourself a smile. What a positive post!!! I really love it! I'm always nervous when people claim to give fast results. So, I am pretty much in love with this! Great post! Yes! Another thing I have seen so often is the angle of the camera....the before is taken with the camera at an angle below eye-level, the second with it slightly above. It's so frustrating!